Heat oil in a 10-inch sauté pan, add the bell peppers, onions, and garlic and cook until translucent. Add the Creole seasoning and fried potatoes. Let the hash cook for 1 minute and then add the crawfish and the green onions; continue to cook until the crawfish meat is hot and then place in serving bowls. 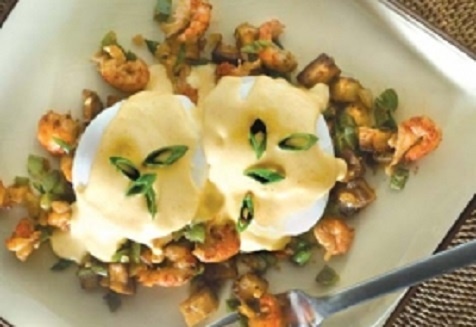 Top each portion with 2 poached eggs and each egg with Hollandaise sauce. Melt the butter and keep it warm. Heat the lemon juice until just warmed. Have small saucepan with boiling water and a measuring tablespoon ready. Place the top of a double boiler over (not in) hot water (this means the bottom of the top of the double boiler should not make contact with the water heating in the bottom half of the double boiler). Place the egg yolks in the top of the double boiler and whisk until they begin to thicken. Now add 1 tablespoon of the boiling water. Continue to beat the sauce until it begins to thicken. Repeat with the remaining water, 1 tablespoon at a time, beating the mixture after each addition. Now add the lemon juice. Remove the double boiler from the heat. Beat the sauce briskly with a wire whisk. Continue to beat the mixture as you slowly pour in the melted butter. Add the salt and cayenne to taste, and beat the sauce until it is thick. Serve immediately.